How many times has it happened to you, when you have Placed your iphone somewhere and just can't remember where, you look for it all over the room / house / office, causing you frustration and the situation gets worst if you are short on time and have to be somewhere fast. Wouldn't it be great, if you could say iphone out loud and the phone tells you where it is by ringing? well, iSeeker does exactly that. It enables your phone to ring when ever you say iPhone out loud. 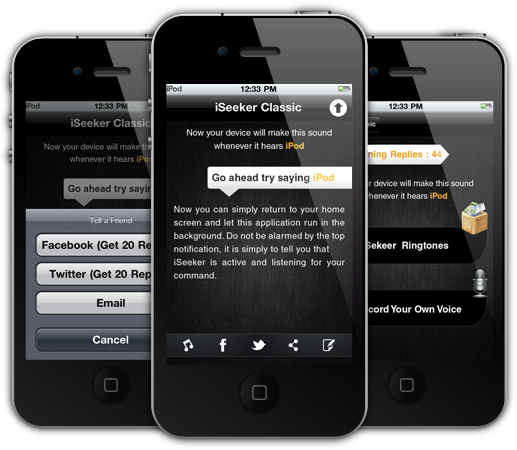 Install the app now and be free from searching your iPhone around your room, house or office forever. This app does not have any effect on your iPhones battery, processing, or functionality - run it once, and keep it running in the background. Please note, that this is not an anti theft app, it only makes the iphone or iPod touch or iPad ring when it hears iPhone or iPod or iPad. Keep an eye out for the updates - as iSeeker will become bigger and better.